Discussion in 'Sports and Entertainment Center' started by Blaze, Nov 28, 2018. So, this is a new league starting up next year, and some how until tonight I never even heard of it. 8 teams, starting one week after the Super Bowl. 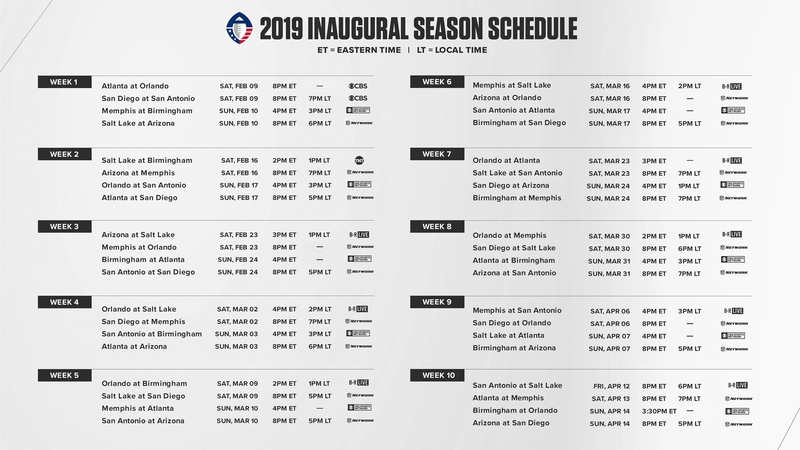 Arizona Hotshots, Atlanta Legends, Birmingham Iron, Memphis Express, Orlando Apollos, Salt Lake Stallions, San Antonio Commanders and San Diego Fleet. So this is something that’s gonna be with CBS, so I guess I’ll give it a shot. More football the better. Pretty cool the Legends got Aaron Murray as their QB. FLRacingFan and AuzGrams like this. I think I heard about this but assumed it would go nowhere. Well seems they will at least get one season, so I’ll surely check it out. FLRacingFan and Blaze like this. Exactly, and the fact I’ll have myself a team to watch and root for from my state makes it better for me. Not to sure about the colors and jerseys yet but hey, I’ll rep the colors haha. These types of leagues typically don’t last but a year or two, but I’ll probably try to watch a few games while it’s here. FLRacingFan, ToyYoda and 2 Sweet like this. Yeah, the coaches are more impressive then the players. Any different rules? I'll give it a watch, isn't there another league starting up in 2020? XFL could be good as well once it starts up, so we should wait to see. XFL starts up then. So honestly hoping all of these leagues are good, have good fun games. To me the more football I could have the better like I’ve said a few times haha. Yeh especially filling that void until baseball starts, as I don't think I'll be watching as much Nascar with the new rules package in 2019. I’ll even give the rules package a shot. Tho if it is bad at least then I’ll be able to watch the games without a worry haha. @Mopardh9 you asked about the rules and this is something I just found. Outside organizations will handle head-safety protocols. Passing rules are the same as in the NCAA and CFL, in which catches are made with one foot inbounds, unlike the NFL, where they must have both feet inbounds. Hmm intersting rule about onside kick, I'd have to see how that works. I don't like the 1 foot inbounds rule, but othere than that, seems ok.
That’s part of why I like college is for the one foot inbounds rule. But I mean it’s not one I have to have. But yeah the onside kick thing, I hope honestly it’s not something people can abuse, because if some game you really are getting the best of a team you can probably abuse it and I wouldn’t really care for it. So hopefully it gets explained better later on and it’s something you can’t just do unless in a moment where you need to do it. I might go check out the Orlando Apollos, they'll play at UCF and after looking at the roster and learning that it's more of a regional type of thing it seems kinda cool. Lots of former Gators, Hurricanes, Knights, etc. and Steve Spurrier is the coach. Having a TV contract, live streaming, and gambling are all pretty good for business so maybe they'll make it last for a while. I think it needs to be more than 10 yards. 4th & 10 has a way higher conversion rate than an onside kick. Closest team to me would be the Memphis Express, but I saw enough of Zach Mettenberger when he was here. I thought it was kinda sad how low he went in the QB draft when I looked earlier. Oof. Opening weekend. Time to see if this bird will fly. Blaze, 2 Sweet and FLRacingFan like this. I'll watch, but will definitely be confused by the rules for the first few weeks. Should be able to watch 3 out of 4 games each week. I have no idea what B-R Live is though. I'm tempted to go see the Apollos tomorrow but at the very least I'll be watching on TV. I'd consider going to a game if there were any teams close to here, which isn't the case. It would also depend on ticket price. I go to our arena football team games now and then just because tickets are affordable. Gonna have to give this a view today to hopefully fill my need for more football. Don't have any expectations heading in other than wanting to be entertained. Okay, glad that rule actually really got explained because I was sitting here thinking if a team was really good could just do that a couple times during a game and make that lead go up. This is much much better. There is a hockey game on and Wichita State is playing, yet I will probably tune into the football game. I'm just very curious to see what kind of excitement this new league produces. Hopefully it's not a dud. Looks like football, sounds like football..... I guess it is football. fergy1370, 2 Sweet, FLRacingFan and 2 others like this. Those Atlanta uniforms look like the pouch that Crown Royal comes in. Hotrod, Ilovedthe90s, FLRacingFan and 1 other person like this. Speaking of uniforms, what's up with those refs uniforms? They look strange. Yeah, not sure what kind of look they’re going for with those. If they had any kind of a beer gut, that would look real bad. Ilovedthe90s and ToyYoda like this. I like the mic and video from the replay booth. Awesome addition to the game. So far these teams are proving they're every bit as productive as the NFL Super Bowl competitors. ToyYoda and Brentford like this.